David Lee Gow has been the involved in the prosthetic management of the Osseointegrated clients since 2000, as the Prosthetist responsible for the management of Trans-femoral amputees for the OPRA program (Osseointegration Program for the Rehabilitation of Amputees). Although the procedure was first undertaken in Sweden 1994 only a small number of suitable clients have been fitted with Intregrum osseointegrated implant and articulated prosthesis in Australia to date. Additional research and experience has expanded the knowledge and implications of such a surgical intervention. The system is now available and is an option for the ‘suitable’ trans-femoral and trans-humeral candidates. A collaborative approach is required between client, surgical team and rehabilitation team to realize the potential of this technology and treatment regime. A summary of the osseointegration program, extrapolated from the ‘Information for Patients with an above knee amputation’ Sahlgrenska University Hospital, outlines the rehabilitation rationale and aims of the OPRA program. Many people who have tried to use or are using an above knee prosthesis have reported a range of problems and difficulties in using a prosthesis with a prosthetic socket. In a Swedish scientific survey of patients with a unilateral above knee amputation, 72% report problems with heat and sweating in the prosthetic socket, 62% report problems with chafing from the socket, and 44% say it is uncomfortable to sit while wearing the prosthesis and that these difficulties considerably reduce their quality of life. Direct bone anchorage means that the prosthesis is attached without using a socket. The method is based on the principle of Osseointegration developed by Per-Ingvar Branemark in the 1950’s, which has been in clinical use for prosthetic replacement of teeth since 1965. Rickard Branemark made further developments to the technique and componentry in 1994. By surgically implanting a titanium screw, known as a fixture, into the femur/humerus – the thigh/arm bone – the method produces a direct attachment for the prosthetic leg/arm. The main difference between a conventional socket prosthesis and a bone anchored prosthesis is the absence of a socket, which means the prosthesis always fits, always attaches correctly and is always firmly held in place. The absence of a socket also relieves other problems directly related to the use of a socket, such as heat, chafing and discomfort. The treatment involves two surgical procedures. In the first operation, a specially designed titanium screw known as a fixture is inserted into the residual femur. The fixture is then allowed to heal into the bone for 4-6 months with no load. During this period it is usually possible to use a standard socket prosthesis as soon as the residual limb has healed. In the second procedure an extension known as an abutment is attached to the bottom of the fixture. This abutment protrudes from the skin penetration area and serves as the attachment onto which the prosthesis is screwed. However, to ensure a solid attachment between the titanium fixture and the bone, the bone needs to be carefully subjected to a load before the patient can start walking properly with a prosthesis again. This is done through controlled, gradually increased training using a short ‘training prosthesis’. It is not possible to walk with the training prosthesis. The real ‘articulated’ prosthesis is fitted around 2-3 months after the second operation. In the months that follow the prosthesis can gradually be used more and more, although always with a pair of crutches. Walking without support or with only one crutch is possible around 4-6 months after the second operation. The first operation generally requires 5-7 days in hospital, and the second about 10 days. The overall length of the treatment including both operations, rehabilitation and prosthesis provision is estimated at around 9 months for patients with a normal bone quality. The point at which the abutment protrudes is called the skin penetration area. Just as it is important always to brush your teeth morning and evening, the skin penetration area must be cleaned twice a day. 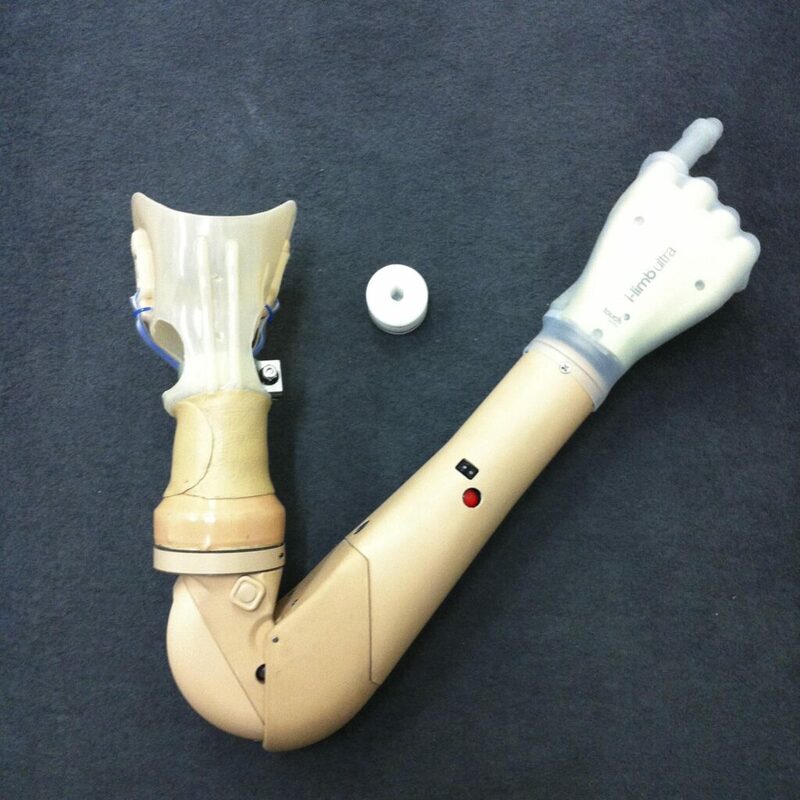 The prosthesis itself is made up of much the same parts as a standard prosthesis. However some components, such as certain knee joints, may not be suitable. At the top of the prosthesis is a special connector , AXOR, which forms the attachment between the abutment and the prosthesis. The connector has an in-built safety mechanism to prevent bone damage in the event of excessive loads, such as in a fall. As with all surgical treatment, there is a risk of complications which can alter the treatment or compromise the results. Superficial infections in or around the skin penetration area are not uncommon. These can normally be treated by particularly careful cleaning, although antibiotics may sometimes be required. More serious complications such as the fixture working loose or rupture of the attachment sections or the bone can also arise. Most complications are treatable. Once treatment is complete, regular medical check-ups are required by both the surgical and rehabilitation team. 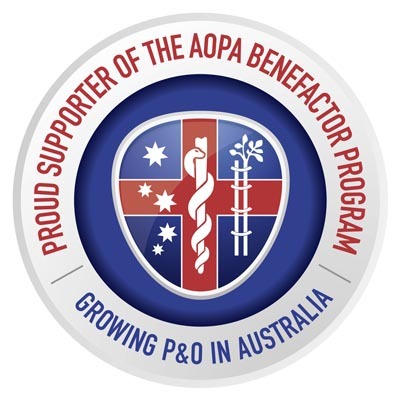 Please feel free to contact ProMotion Prosthetics directly for more information in regarding the prosthetic Osseointegration rehabilitation for amputees. S Jonsson, K Caine-Winterberger, R Branemark (2011) Osseointegration amputation prostheses on the upper limbs: methods, prosthetics and rehabilitation, 190-200. In Prosthetics and orthotics international 35 (2). Laurent Frossard, D L Gow, Kerstin Hagberg, Nicola Cairns, Bill Contoyannis, Steven Gray, R Branemark, Mark Pearcy, David Lee Gow, Richard Brånemark (2010) Apparatus for monitoring load bearing rehabilitation exercises of a transfemoral amputee fitted with an osseointegrated fixation: a proof-of-concept study, 223-228. In Gait and Posture 31 (2). Laurent Frossard, Kerstin Hagberg, Eva Haggstrom, David Lee Gow, Rickard Branemark, Mark Pearcy (2010) Functional outcome of transfemoral amputees fitted with an osseointegrated fixation: Temporal gait characteristics, 11-20. In Journal of Prosthetics and Orthotics 22 (1). Kerstin Hagberg, Rickard Brånemark (2009) One hundred patients treated with osseointegrated transfemoral amputation prostheses—Rehabilitation perspective, 331-344. In J Rehabil Res Dev 46 (3). Winson C C Lee, Laurent A Frossard, Kerstin Hagberg, Eva Haggstrom, David Lee Gow, Steven Gray, Rickard Brånemark (2008) Magnitude and variability of loading on the osseointegrated implant of transfemoral amputees during walking., 825-833. In Medical Engineering & Physics 30 (7). Laurent Frossard, Nathan Stevenson, James Smeathers, Eva Häggström, Kerstin Hagberg, John Sullivan, David Ewins, David Lee Gow, Steven Gray, Rickard Brånemark, D Lee Gow (2008) Monitoring of the load regime applied on the osseointegrated fixation of a transfemoral amputee: a tool for evidence-based practice, 68-78. In Prosthetic and Orthotics International. 32 (1). W Lee, L Frossard, K Hagberg, E Häggström, D Lee Gow, S Gray, R Brånemark (2007) Magnitude and variability of loading on the osseointegrated fixation of transfemoral amputees during walking, 825-833. InMedical engineering & physics. L Frossard, N Stevenson, J Smeathers, D Lee Gow, S Gray, J Sullivan, C Daniel, E Häggström, K Hagberg, R Brånemark (2006) Daily activities of a transfemoral amputee fitted with osseointegrated fixation: continuous recording of the loading for an evidence-based practice, 53-62. In Kinesitherapie Revue 6 (56-57).